$180.00 Sniper Badge, circa 1943-44. An early version by NKPS Factory. In very fine to excellent condition, well above average for a Soviet WW2 combat proficiency badge. $240.00 Sniper badge, early 1950s. Very scarce post-war version by the MTKh workshop (rated 5 for rarity by Airapetyan). In very fine to excellent condition and includes original MTKh screw plate. $110.00 Excellent Machine-Gunner badge, uncommon post-WW2 version by the MTKh workshop. In outstanding condition. $60.00 Excellent Machine-Gunner badge, "Classic Flat", 1950s. Relatively uncommon post-war version by the Pobeda Factory. Very fine to excellent condition. $110.00 Excellent Mortar Man badge, Shcherbinskiy Factory version, circa mid-1940s. In very fine to excellent condition. Comes with original maker marked screw plate. 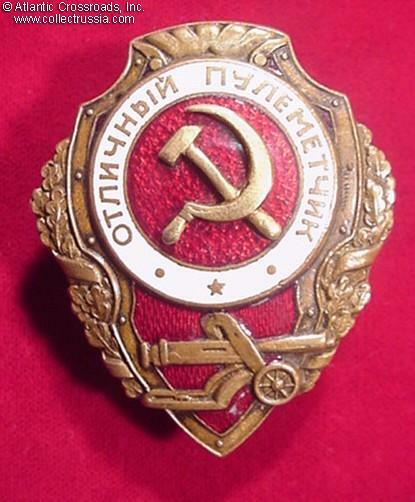 $490.00 Excellent Artilleryman badge, first version with superimposed hammer & sickle emblem, circa 1942. Scarce and attractive piece in superb condition. $160.00 Excellent Artillery Man badge, mid 1940s. This very early version came immediately after the Type 1 with superimposed hammer & sickle emblem. In very fine to excellent condition - far better than the average for a badge of WW2 period - and includes scarce original screw plate marked "Foto-Yuvelir, Moscow". A very interesting piece! $195.00 Excellent Artilleryman badge, scarce variation made in occupied Germany	(aka "NKPS Experimental Factory"), circa late 1940s. In very fine condition. $75.00 Excellent Artilleryman Badge, 1953-1957. The last, "Classic Flat" variation of the badge. In near mint condition. $250.00 Excellent Tanker badge, variation by the NKPS Experimental Factory (probably located in occupied Germany). Rated "exceptionally rare" (rarity rating 5) by Airapetyan. In very fine condition and includes scarce original screw plate. $125.00 Excellent Mine Layer badge, mid 1940s. Early elongated version. In superb condition - practically impossible to upgrade! Includes original NKPS screw plate. $170.00 Excellent Mine Layer Badge, mid 1940s. Uncommon version of the elongated early type by the NKPS Factory featuring thicker flames on the sides of the mine. In superb condition, practically impossible to upgrade. $130.00 Excellent Combat Engineer badge, mid 1940s. A superb early NKPS example in very fine to excellent condition. $295.00 Excellence in Railway Troops badge, mid 1940s. In excellent condition, absolutely superb for this relative scarce WW2 Red Army Otlichnik badge. Includes original NKPS screw plate. $90.00 Excellent Reconnaissance Scout Badge, circa 1946-48. Very scarce, early post-war variety manufactured by the MPS Factory (formerly NKPS). In very fine condition. $75.00 Excellent Reconnaissance Scout badge, circa mid-1950s. In very fine condition. $70.00 Excellence in Signal Corps badge, ZhRPT Factory, mid-1940s. An interesting piece with off-center location of the screw post. In very fine condition; includes original screw plate of WW2 period. $75.00 Excellence in Signal Corps badge, "First Unified" type, early 1950s. In excellent condition and includes original Pobeda Factory screw plate. $95.00 Excellence in Antiaircraft Gunnery badge, NKPS version, mid 1940s. In very fine to excellent condition, far better than the average. Includes original screw plate. $90.00 Excellence in Antiaircraft Gunnery badge, circa late- 1940s.First version by the Pobeda Factory featuring domed center medallion and "square" font. In excellent condition. $70.00 Excellence in Antiaircraft Gunnery, circa mid to late 1950s. The last, "Classic Flat" version by the Pobeda Factory. A perfect example from the height of the Cold War. $180.00 Excellence in Road Construction badge, mid to late 1940s. In very fine to excellent condition. $195.00 Excellence in Road Construction Badge, circa mid-1950s. A very scarce variation by the Pobeda Factory, in outstanding condition. $45.00 Excellent Driver badge, Pobeda Factory, mid to late 1950s. In very fine condition, with tiny, almost unnoticeable damage to the white band - otherwise perfect. $450.00 Excellent Baker badge, mid 1940s. The most scarce of all the badges in WW2 Proficiency series. In very fine condition. $180.00 Excellent Tractor Driver badge, mid 1940s. The first version of the badge. Very fine to excellent condition, outstanding for this relatively scarce badge. $195.00 Excellent Firefighter badge, "Classic Flat" version by Pobeda Factory, circa mid to late 1950s. In near mint condition. $70.00 Document for Excellent Firefighter badge, issued in 1963 by the Ministry of Protecting the Public Order of Georgia. Correct for an early, 2-piece badge in brass. Very uncommon document in excellent condition. $15.00 Excellent Military Firefighter, circa 1960s. In aluminum and paint, one-piece construction. Last variation of the Military Firefighter Badge. $60.00 Excellent Rifleman (aka "Excellent Sharp Shooter") badge, circa late 1940s - early 50s. A relatively uncommon version by the Pobeda Factory featuring red enamel is of lighter shade than on more common issues. In very fine to excellent condition.